On Monday, Sept. 23 at 1:30 p.m., Rabbi Alan Iser, a professor in the Department of Theology and Religious Studies, will present this year’s annual Conscience of the Holocaust Lecture. Rabbi Iser’s talk is entitled “Where Was God At Auschwitz? 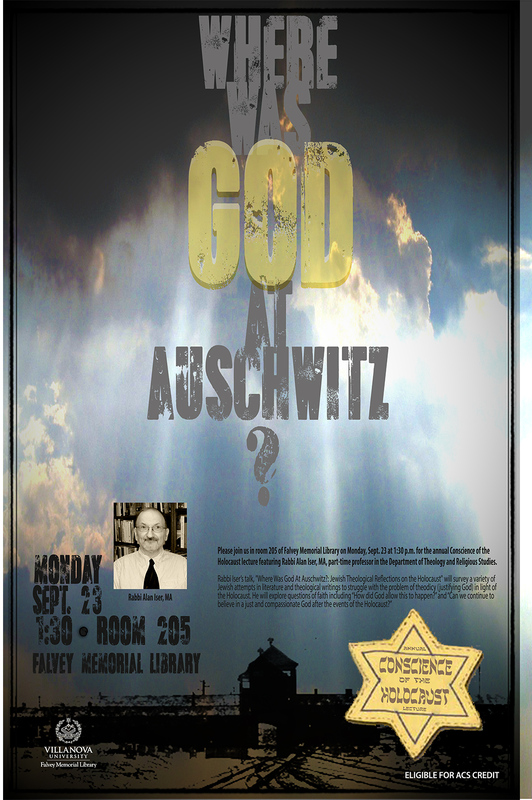 : Jewish Theological Reflections on the Holocaust,” and will explore various struggles with theodicy in Jewish literature and theological writings.The inaugural Conscience of the Holocaust lecture was delivered in Sept. 2006, on the first anniversary of the peaceful death of modern Jewish hero Simon Wiesenthal. Wiesenthal’s motto of “Justice, Not Vengeance” was the inspiration for the series. 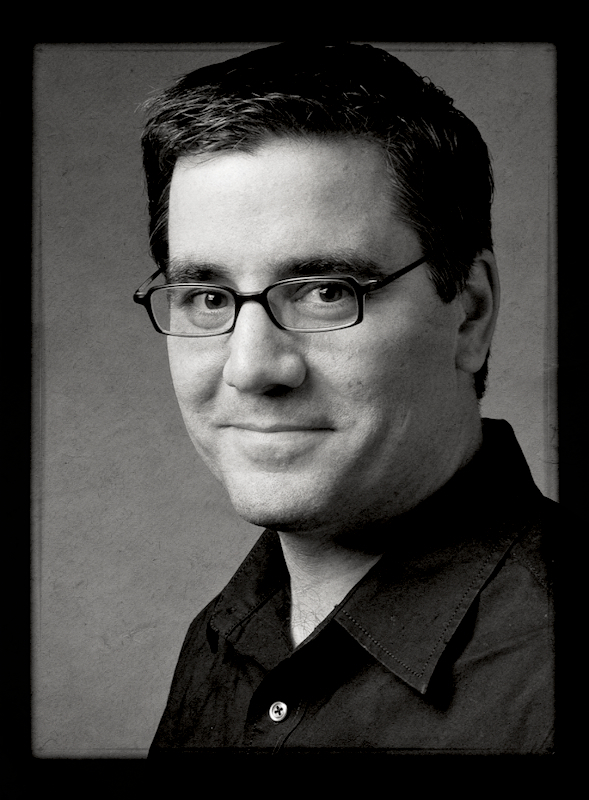 Each year’s lecture represents an effort to combat non-violently antiSemitism, hate, terrorism, and genocide, and to positively promote, through intellectual engagement, human rights and the dignity of every human person.This event’s Dig Deeper content, collected by First-Year Experience/Humanities Librarian Robert LeBlanc, can be found below. The ethical, philosophical and theological study of the holocaust and its influence on religious thought is a complex and varied subject. Fortunately, Falvey Memorial Library has a large number of resources to help you explore the subjects of theology and the holocaust on a deeper level. A search of Gale’s Opposing Viewpoints Resources in Context (Gale) provides a complete overview of both sides of a large number of ethical issues and allows users to access information through viewpoint articles, topic overviews, statistics, primary documents, links to web sites and full-text magazine and newspaper articles. A specific search in this resource for the terms “Jewish Holocaust,” Holocaust, or genocide provides a large number of articles and opposing viewpoints exploring the efficacy of remembrance in the avoidance future holocausts to the ethics of invoking holocaust experiences to justify modern political decisions. For more theological oriented articles, a search of ATLA Religion Database (EBSCO) will produce a large number of results on the topic of theology and holocaust studies. ATLA Religion Database is the leading international database indexing citations in all scholarly fields of religion. Using the database’s date and subject limiters will allow researchers to narrow in on a specific aspect of the holocaust and theology. 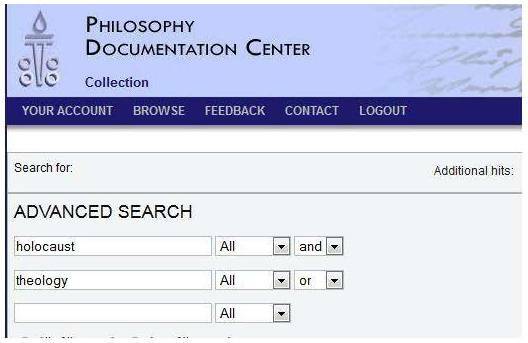 Finally, a general search of the Philosophy Documentation Center for both the terms Theology AND Holocaust will yield results that explore the role of philosophy and social engagement when faced with the horrors of genocide. Links and research instructions prepared by Rob LeBlanc, first-year experience/humanities librarian.Links and research instructions prepared by Rob LeBlanc, first-year experience/humanities librarian.